Disability Studies, Temple U.: Road Trip: DisTHIS, New York! Road Trip: DisTHIS, New York! Melania Moscoso and Mike Dorn traveled up to New York last Wednesday to check out the disTHIS! 2nd Anniversary Criptastic Celebration. The evening included a little bit for everyone, including some salacious film shorts (featuring special guests Mat Frazer and Liz Carr from the BBC Ouch! Podcast) and the East Coast debut of Bård Breien's "The Art of Negative Thinking." The Norwegian director's feature film debut is the story of Geirr, his girlfriend Ingvild, and their encounter with the "municipal positivity group" [must be a Norwegian thing!] Geirr has remained reclusive and bitter since his accident, turning to his heavy metal music for relief, and Ingvild is willing to try anything to break him out of his despond. But as it turns out, the positivity group and their leader have their own issues to work through. And Geirr is just the one to help them learn the negative arts. Lawrence Carter Long organizes the events for the Disabilities Network of NYC and takes particular care - reviewing new film for works of interest. 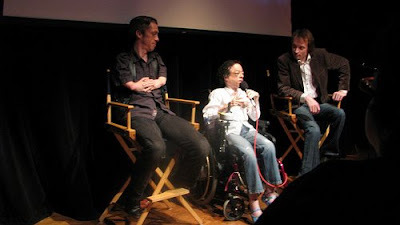 The audience has come to expect works that work creatively against the standard conventions of disability in film. Even works deriving inspiration from the "freak show" canon are considered, as long as they work to reinvent this time-tested genre. International films that lend insight into contrasting cultural frameworks (such as the Spanish films that Melania has been reviewing) are also very popular. We can't wait to see what Lawrence selects for this coming Halloween! It was an easy and fun trip. Several busses a day run between between Philadelphia and New York. Over the years I've taken one of the various "Chinatown buses" several times, picking it up at the Greyhound bus terminal near the Convention Center in Philadelphia, and catching the return bus from the north side of the Manhattan Bridge abutment. But today Melania and I checked out a new alternative, the cheaper and more relaxing and accessible Bolt Bus, that leaves from 30th Street between Walnut and Market in West Philadelphia, and delivers the traveler at 6th Street between Canal and Grand in Soho. Arriving early (due to the Bolt Bus's limited schedule) we had a chance to check out some of the local sights, including the beautiful and fully accessible Mulberry Street Branch Library (another view) at 10 Jersey Street [Between Lafayette & Mulberry Streets]. Visit their website to learn more about the disTHIS! Film Series and plan your next trip to New York. Sign up on Yahoo for regular email updates, or "friend" them in MySpace. There are some exciting events being planned in conjunction with the upcoming meeting of the Society for Disability Studies, June 18 - 21 at Baruch College, the City University of New York, so stay tuned! I didn't know about the Bolt Bus! I'm totally taking it next time I go to nyc. Screw putting my wheelchair in the luggage compartment of the Chinatown bus and staggering my way on...this is such a better option! Disability Blog Carnival #38 is up NOW! Disability Blog Carnival #37 is up NOW!